A new study from Harvard Medical School and Oxford University reports that obesity may have replaced underweight as the new malnutrition of the homeless and that obesity is just as common among the homeless as it is among the general population. The study suggests diet and natural body adaptation to starvation as two possible causes. 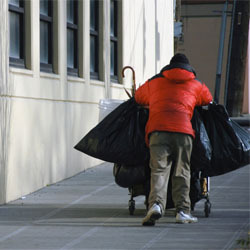 A new study dispels the myth that, in general, the homeless are starving and underweight. Researchers from Harvard Medical School and Oxford University report that obesity is just as common among the homeless as it is among the general population. One reason, the authors suggest, could be because cheap, instantly satisfying foods often contain a high levels of fat and sugar. Another reason could be that bodies experiencing chronic food shortages adapt by storing fat reserves. This study supports other research that demonstrates that the highest prevalence of obesity now exists in low-income groups. The study concludes that although being underweight has traditionally been associated with homelessness, obesity may have replaced underweight as the new malnutrition of the homeless. These findings will be published in the Journal of Urban Health. Researchers examined the body mass index (BMI) data of 5,632 homeless men and women in Boston, and found that nearly one-third of them were obese. They used the electronic medical records at 80 hospital and shelter sites for the homeless in Boston, using data from the Boston Health Care for the Homeless Program –one of the largest adult homeless study populations reported to date. They found that just 1.6 percent of the homeless in this sample could be classed as ‘underweight’. Morbid obesity – where people are 50 to 100 percent above their ideal body weight – was three times more common with 5.6 percent of homeless adults classed as morbidly obese. The study authors also compared the BMI of the U.S. homeless adults with 5,555 non-homeless adults, using data from the National Health and Nutrition Examination Survey. They found that obesity amongst the homeless (32.3 percent) was almost as high as among the general population (33.7 percent). However, homeless women had a significantly higher percentage of obesity (42.8 percent) than non-homeless women (35.3 percent). The study suggests that factors associated with being homeless, such as a largely sedentary lifestyle, sleep deprivation and stress may also contribute to the high prevalence of obesity. Lead study author, Katherine Koh, who carried out the research at the University of Oxford but is now an MD student at Harvard Medical School, said, “The recently described ‘hunger-obesity paradox,’ which describes the co-existence of hunger and obesity in the same person, may help explain these findings. The rise of obesity among populations that lack regular access to food has recently been documented in developing countries and certain low-income populations. This research shows that this paradox may affect homeless people as well.” One reason may be that homeless individuals are more likely to buy inexpensive, low nutrient but high caloric foods. There are also physiological changes that occur in the body when food intake is inconsistent. 2 Comments on "Obesity Affects One-Third of US Homeless"
The paradigm of obesity is of sloth, overeating, no self control, etc. This work is excellent because it turns that paradigm on it’s head; how can people who can’t afford housing possibly have enough money to eat until obesity? Maybe a few do, but surely not 30-40%. Obviously, there are other factors at play driving obesity, other than food itself. Two things: I worked briefly at a soup kitchen and there was plenty of food, but it was mostly starchy fill-em-up stuff, like pasta, potatoes,macaroni and cheese, bread. And donated breads and pastries like donuts and muffins, stacked high on the table. If you grab a bunch on the way out and eat them in lieu of anything else every day, combined with sedentary habits, that says something. The other thing is if a the homeless mentally ill are receiving treatment, psychiatric drugs, those drugs will put on a pound a DAY on you. Whether you’re homeless or a millionaire.